When do you need voice changing while in-games? For gamer, like me, I see that there are few reasons make me apply voice changing or voice effects for my own voice while in-games. Firstly, the voice morpher or voice changing effects make my voice sound older and specially "manly more". This is my very favorite benefits from the AV Voizgame for years. You may understand this circumstance if you ever listened to your own recorded voice and realize that it sounded a little bit feminine :D.
Secondly, sometimes the voice effects do really thrill me while I'm engaging into some online role-playing games (RPG) like Dungeons & Dragons, World of Warcraft, Second Life, Lord of the Ring, etc. Especially while I'm join the Org party in WOW. It's just amazing cool! Another reason for using voice changer software for in-game voice chat was learnt from my nephew. You know, as his first days to join the online games, he take his time to fool around with a sweet lady voice for begging the items. Who care? He's just kid and it's just for fun though. However, the later experience from him would somehow thrill most of you. It was that he become a leader of a small group, and noway the others would agree to his decision made by a little boy's voice. So, the voice changer again help him with a very manly voice at ease. Built-in Recorder allows users to record voices and sounds from almost any Game. Transparency skin allows the program to be totally invisible in Transparent Mode. 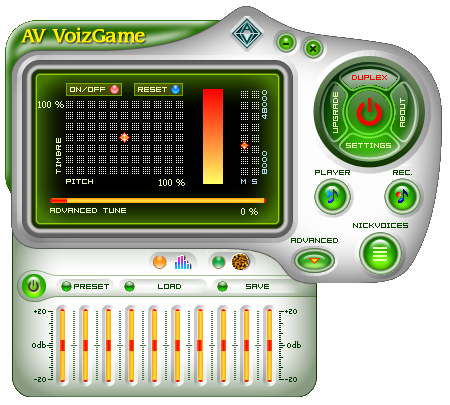 Shortcut key helps to activate VoizGame while in your Online Game. Save your computer’s resources with the Minimize to System Tray feature. Compatible and work well with Windows 8. In conclusion, voice changing for gaming is something really funny and thrilling. Mots of you will agree with me as soon you take your time to try it.